On Saturday, January 21, 2017, millions gathered in Washington D.C. and in hundreds of cities around the world. 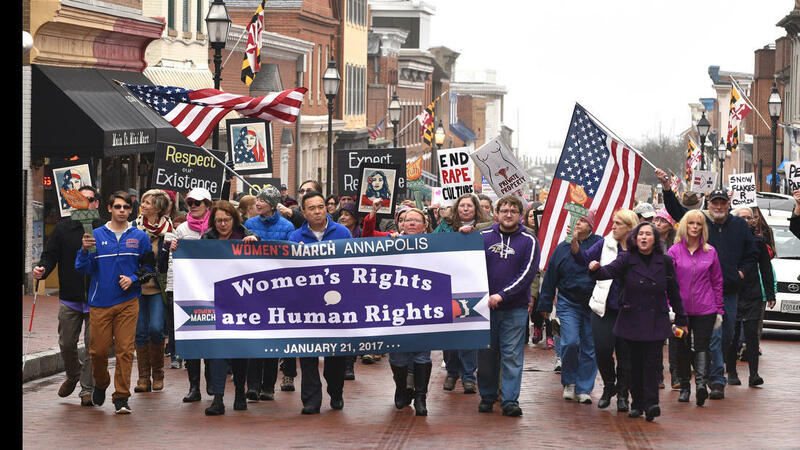 We marched in solidarity with the Women’s March on Washington here in Annapolis. We assembled at City Dock and marched up Main Street to Lawyer’s Mall at the State House, maintaining peacefulness and positivity. We had fantastic speakers – state senator John Astle, Delegate Mark Chang, and AA County Women’s Commission member Alexus Viegas – a crowd of about 1500! We stand together in solidarity with our partners and children for the protection of our rights, our safety, our health, and our families – recognizing that our vibrant and diverse communities are the strength of our country. The rhetoric of the past election cycle has insulted, demonized, and threatened many of us – women, immigrants of all statuses, those with diverse religious faiths particularly Muslim, people who identify as LGBTQIA, Native and Indigenous people, Black and Brown people, people with disabilities, the economically impoverished and survivors of sexual assault. We are confronted with the question of how to move forward in the face of national and international concern and fear. In the spirit of democracy and honoring the champions of human rights, dignity, and justice who have come before us, we join in diversity to show our presence in numbers is too great to ignore. We call on all defenders of human rights to join us. The Women’s March will send a bold message to our new administration on their first day in office, and to the world, that women’s rights are human rights. We stand together, recognizing that defending the most marginalized among us is defending all of us. This is an INCLUSIVE march, and EVERYONE who supports the march’s goals are welcome to join this peaceful gathering! * We are non-partisan, and will not use the Women’s March primarily to criticize politicians or political parties. * We will use not violence (physical or verbal) towards any person.